Also known as a pontic, a dental bridge creates a false tooth which are fused between two crowns to fill in the area left by a missing tooth. The two crowns holding the bridge in place, are attached onto your teeth on each side. This procedure is used to replace one or more missing teeth. Fixed bridges cannot be taken out of your mouth. 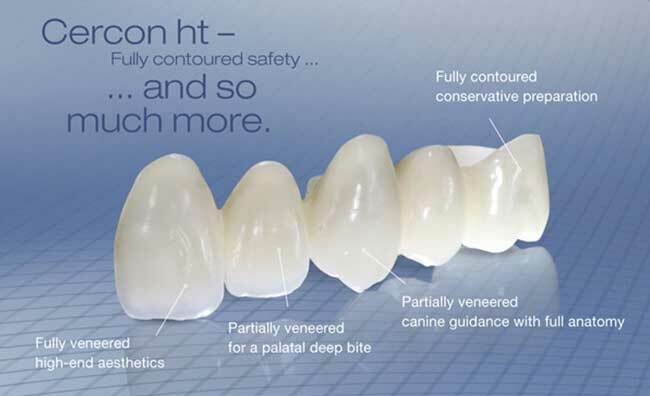 Zirconia is an all-ceramic material that is exceptional strong , aesthetic and bio-compatibility. You may need 2 -3 appointments. On your first appointment, cleaning and removing decay from the tooth under local anesthetics will be the first step. The surrounding teeth will then be prepared by shaving away a tiny part of their structure to accommodate their crowns. You will need to have an impression taken of your teeth in specialized dental putty. The dentist will make the crowns’ color match that of your other teeth. While you are waiting for the lab has completed the bridge, you will have a temporary bridge fitted so that your teeth and gums will be properly protected during the wait. Once the new bridge is ready your dentist will make some final checks and if any adjustments are required, they will be made there and then. Once you are both happy with the fit and appearance, your dentist will fix the bridge using dental cement.